At the trans kids’ parents’ support group on the Tuesday before Thanksgiving people were talking about holiday plans and extended family who were less than supportive of their kids. When asked, Beth and I reported that we were spending Thanksgiving at the beach, just the four of us (and Christmas with an accepting grandmother). Some people were a little jealous. 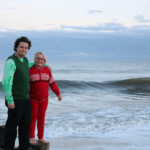 We’ve spent four of the past five Thanksgivings in Rehoboth. It’s a nice tradition that certainly inspires thankfulness. I was out the door of the rental house headed for the beach around 3:30, about an hour after we’d arrived. (I was disciplined enough to unpack, get food in the fridge, and make our bed first.) 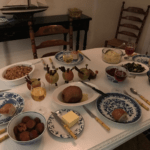 I promised to return between 4:30 and 5:00 to help put the finishing touches on the dinner we—well, mostly Beth—had made at home the day before and transported with us. I swung by Café a-Go-Go for a café con leche before I hit the beach. It was cold, 31 degrees. But my coffee was warm and the late afternoon sun was turning the dry beach grass gold, the sea silver, and the clouds and sea foam faintly rosy. After a short stay on the beach, I headed back to the house to trim and roast Brussels sprouts and to heat up the brandied sweet potatoes. Beth had everything else under control and after we’d made our traditional centerpieces (turkeys made from apples with feathers consisting of raisins and dried cranberries stuck on toothpicks and olives for heads), we sat down to feast on the aforementioned vegetables, plus a tofurkey roast, stuffing, mashed potatoes with mushroom gravy, cranberry sauce, and rolls. Later we ate pumpkin and apple pie and watched an episode of Blackish. Beth turned fifty-two the next day and we brought her presents while she was still in bed. The kids got her toffee and a chocolate coffeecake. I got her gift certificates from AFI and the promise of a dessert date. We ate the coffee cake with breakfast before North and I headed out to Christmas shop. People always assume we’re headed for the outlets when we say we’re Christmas shopping in Rehoboth and while we do sometimes visit them, we mostly stick to the downtown shops. The bookstore and the tea and spice shop are favorites of ours. Actually, for me it was more watching North shop than doing any of my own. They were a shopping whirlwind, getting all of their shopping done in one day, most of it that morning. Our last stop was the bakery for Beth’s birthday cake, which I’d pre-ordered. 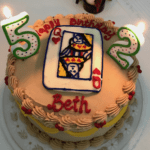 It was a chocolate cake with coffee frosting, which is what I usually make for Beth’s birthday but since I wasn’t going to be the one decorating, I thought it I should have the bakers do something beyond my capabilities—so I asked for a playing card made out of frosting, specifically the Queen of Hearts. Can you guess why? It was because there are fifty-two cards in a deck and she’s the queen of my heart. (North had known about this plan for a few weeks and they were quite taken with it.) It was a long hike out to the bakery, which is up near Route 1, and then back to the house so I was glad to have North with me to wear the backpack full of gifts while I carried the cake box. We even managed not to slip and fall on the ice-slicked sidewalk near the canal. We had Thanksgiving leftovers for lunch, followed by birthday cake and ice cream. Then Noah, who’d been at the house that morning doing Logic homework, came shopping with me and North. After that, I took a solo walk on the beach and saw a ragged V of geese flying south before going back to the house to collect everyone and walk back to the beach for our Christmas card photo shoot. Beth used Noah’s camera to take pictures of the kids standing on a jetty and some of them jumping or doing cartwheels (that was just North) on the sand. From the beach we walked to Grotto, where we had pizza, and then to the bandstand for the holiday singalong and tree lighting. It was still pretty cold, probably near freezing, so a half hour seemed about right for this activity. Beth had a hot chocolate in a thermos she’d procured earlier from Starbucks for her free birthday drink. She was pleased it had stayed warm. The kids tried to get hot chocolate at a nearby coffeeshop but the line was crazy so they gave up. The singalong started with “It’s Beginning to Look a Lot Like Christmas” and then proceeded through the usual selection of secular Christmas songs, plus “Let it Go,” (which we all agree is not a Christmas song). While we were singing “The Christmas Song,” when it got to “kids from one to ninety-two, I nudged North and sang, “kids from twelve to fifty-two” instead, because that’s us and it’s the last year it will ever scan because it’s North’s last year with a one syllable age. We walked home via the boardwalk. The moon was either full or close to it and it made a gorgeous white column on the black water. Back at the house, we warmed up with leftover pumpkin pie (and cake) and inaugurated our Christmas special viewing with A Charlie Brown Christmas and How the Grinch Stole Christmas because those are Beth’s favorites. The next day wasn’t quite as busy. I knew it was going to rain in the afternoon so after breakfast at Victoria’s (a boardwalk hotel restaurant), I got in some more shopping, and then settled myself on the sand with an apple-carrot-beet juice to drink while I watched the choppy, gray waves. It was much warmer than the previous two days, in the fifties, so it was pleasant to sit still and just be. North and I met up for lunch at the Greene Turtle, which I patronize mainly for the view. It’s on the boardwalk, one story up, and we got a corner table, surrounded by floor-to-ceiling window on two sides, so I could watch the panorama of boardwalk, beach, and ocean while I ate my apple-pecan salad and split an order of mozzarella sticks with North. Afterward we took a walk on the boardwalk and beach and I took them to a juice bar for an açai bowl. While there I realized I didn’t have my debit card and North exclaimed, “Again?” because I’d just finished telling them a story about how I’d lost one at the Greene Turtle years ago. So I gave North some cash and went back the restaurant in hopes of retrieving it. And luckily, they had it and they didn’t even make me feel like an idiot, saying cheerfully they had a pile of them in the office as people left them on the tables every day. By the time I left the restaurant the second time, the rain had started, only sprinkles, but it was supposed to get heavy so I headed back to the house. We spent a cozy afternoon variously playing Connect-4, reading King Lear and Six of Crows and the New Yorker, and working on college applications. Noah sent off his Ithaca application and started his Boston University one. By dinnertime it was pouring rain and windy, but Beth and North braved the elements to pick up takeout from Grandpa Mac’s. We ate our pasta bowls in front of the television, watching Rudolph the Red-Nosed Reindeer. In the morning we packed and had breakfast at Egg (where for some reason I was the only one to order their scrumptious pumpkin-pecan French toast) and came back and packed some more, and left the house. Noah helped clean out the fridge by eating ice cream, garlic bread, cranberry sauce, and drinking milk and eggnog. It’s handy sometimes having a teenage boy. The kids headed for a hotel lounge where they could squat and watch Dr. Who on a laptop while Beth and I went to sit on a bench on the boardwalk and enjoy a lovely sunny day. Beth read while I wrote most of this blog post by hand in a composition book because I am cutting edge like that. Being slightly more up-to-date than me, North had been vlogging our trip all weekend, constantly recording themselves narrating what they were doing. I find it a little odd, but who I am to talk, really? After I finished writing I took a short walk on the beach and then we all met up on the boardwalk having acquired fries, pizza, and a smoothie for a makeshift lunch. (I also fetched cheese, fruit, and water from the nearby car.) After a trip to Candy Kitchen, the kids and I went down to the water and got our feet wet. They accomplished this by wading barefoot into the water. I was wearing rainboots but I might as well not have been because the very first wave went over the tops and soaked my feet. As I removed the boots, turned them upside down, and peeled my sodden socks off my feet, I regarded the holes in them and decided to just throw them in a trashcan on the boardwalk. As we drove home, I wondered how often they empty those trashcans off season and how long that little part of me will still be there, near the sea and the sand. This entry was posted in Anniversaries, Birthdays and Half-Birthdays, Beach, College Search, Holidays, Travel by Steph. Bookmark the permalink.